Includes: paper book + access code for the interactive online course. This package comprises the second part of the course (B1-C1). 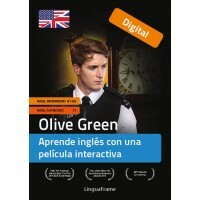 Fun: Olive Green is based on a nearly 3-hour-long action film, which introduces you to the vocabulary and language structures that you will study in the course. While watching, you can decide what course the action will take, as well as play games and solve language puzzles to proceed. You will listen to authentic, modern English language, spoken in a variety of different accents. What could be a more engaging way of learning?